Originally from Memphis, Tennessee, Seph Allen played trumpet to pay his way through college. He started playing drums in 1990 - with his first "real" show as drummer at Lipscomb University for their 1991 production of "Singarama." Later, he moved to Hollywood, CA and attended the Percussion Institue of Technology (PIT) at Musicians Institute before beginning a career as a full-time musician in Memphis - The late 90's found Seph cutting radio and TV spots during the day, teaching high school drumlines and lessons at Memphis Drum Shop in the afternoons and playing rock, blues and soul with several bands on Beale Street in the evenings. Seph also worked for NASA in Texas and Virginia for 13 years, producing TV shows for the space agency such as space shuttle and space station "Mission Feature Packages" and "NASA 360" for NASA TV as well as more than 500 episodes of the "Innovation Now" NASA radio series that continues to air across the U.S. on NPR and university affiliates. He returned to Nashville in 2015 to form his own strategic communications firm, Quindar Media, LLC. spends a healthy portion of his time using his musical skills as examples while training and consulting with leaders on how to cultivate and foster creative teams within bureaucracies. A multiple Emmy-Award winning TV producer as well as a multi-instrumentalist musician, Seph knows what producers are looking for when hiring for sessions. 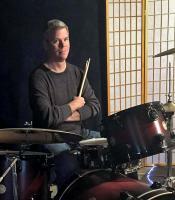 A former instructor for Yamaha Rock School, Seph is a member of the Sabian Education Network and currently teaches drums and percussion at Sam Ash Nashville. Seph’s former students include session players, touring musicians, percussion instructors as well as band directors. Seph loves playing rock and blues - especially with high-energy guitarists. He reads Nashville Number System charts as well as lead sheets and sings backup harmonies best in the low tenor/baritone vocal range. You can find him on Twitter @playdrums.